is a powerful yet easy to handle moving equipment. 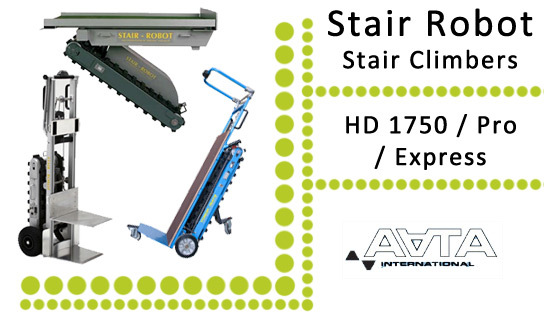 This compact and lightweight powered stair climber can move items up to 175kg with total ease. The versatile unit can be used to easily move loads in and out of vehicles. Two different techniques areavailable to carry goods up and down a stairs either step by step or completely flat on the stairs. This second technique enables the the load to be completely supported by the stairs with zero weight taken by the user enabling completely risk free operation. The Stair-Robot® Express is built to the highest standard with extruded aluminum and perfect welds. It also has the highest quality battery using state of the art manufacturing techniques. The Stair-Robot® Express , can lift loads up to 175kg for 20 steps on a single charge! The battery has a lifespan of 4 to 7years. Every aspect of the design has been scrutinised to give the Stair-Robot® the most ergonomically friendly lifting device on the market.